turned back on}. So now we are living in the Stone Age. and then go to Panera on Monday nights to schedule them to post throughout the week. and I’m mooching off others for TV and internet}. Feel pity on me. basis. I guess I could use the time to catch up on some reading. Got any recommendations? You must see Biggest Loser from last night! They did makeovers and they all look GREAT! I've had Daris picked to win from the first episode. But either way i love the show and the remaining 5 contests all deserve it! you could get netflix and watch some movies that you've been dying to see for awhile? Hang in there! Each day is a day closer to being in your own home. One day at a time. You are a champion, seriously! 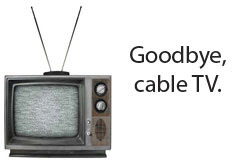 We went 2 years without cable. Now that I have it I will never not have it again! I would love to be able to go without TV because I get so caught up watching re-runs that I have already seen instead of actually doing stuff I need to do. My sis went without cable for several years and she loved it!! The Sweet Magnolias series by Sherryl Woods is great! I'm sorry you haven't been able to get moved in yet!